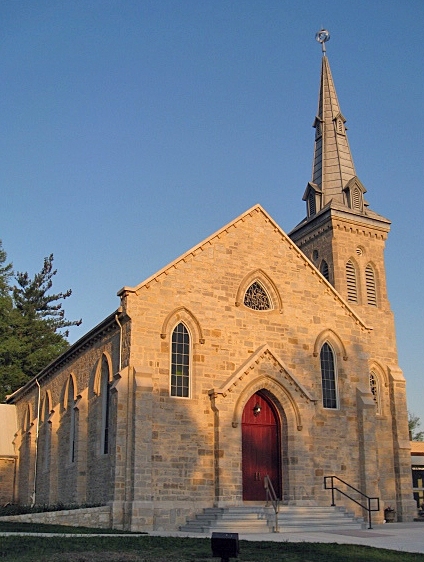 Eliot Chapel is located at the corner of Taylor and Argonne, in downtown Kirkwood, across from the Farmer's Market. We have two parking lots, accessible off Madison, behind the church. Click here for a map of our location and to get directions to the church. Click here for a map showing parking. Eliot Chapel in Kirkwood, Missouri, offers customized wedding ceremonies and can accommodate up to 235 guests in our historic sanctuary. 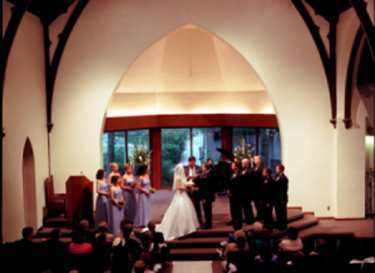 An officiate who is affiliated with Eliot Chapel must perform or participate in the ceremony. 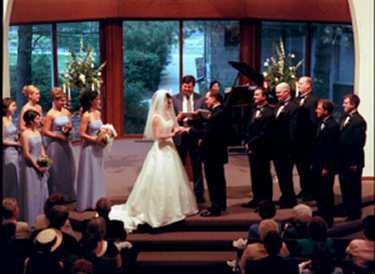 The specific nature of the ceremony – vows, readings, music, etc. – is determined by the bride and groom with the officiate. As a Welcoming Congregation, we are also proud to offer union services. Click here for a document with more information about weddings and pricing. Contact us for more complete information or to check date availability on our calendar. Click here to review our guidelines for memorial services for non-members. Eliot Chapel offers room or space rental for some events, subject to approval and availability. If you are interested in booking space at Eliot, please contact the church office for more information. Click here for an interior map of Eliot Chapel. Please click here to review the Building Use Guidelines.